Colleen studied at Art college for five years and has had two children’s picture books published. The birth of her first child gave her inspiration to design other products for children. Her business ‘Little Carousel’ was launched two years after making for friends and family. 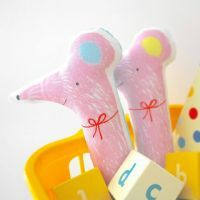 She designs, creates and makes soft toys, rattles, wall banners and illustrated prints from the family home in County Antrim, drawing her ideas from pattern, nature and young daughters.